Pre Winter run around the Coromandel loop. | Triumph Owners Motor Cycle Club NZ Inc.
You are here: Home » Regional News » Waikato/BOP » Pre Winter run around the Coromandel loop. Pre Winter run around the Coromandel loop. 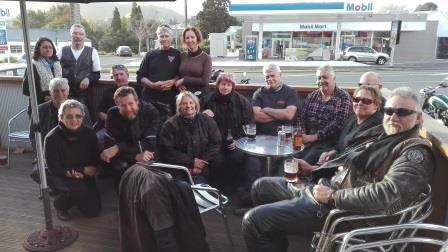 Thanks to the organising skills of Pete and Allen the chapter got together on Sunday for a gaunt over the Coromandel Peninsular. 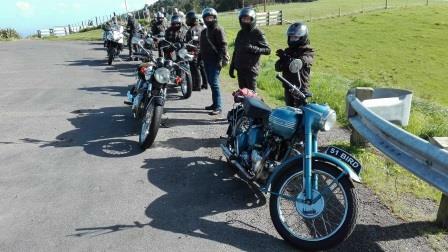 The numbers in attendance were good at 11 bikes and the day just perfect. 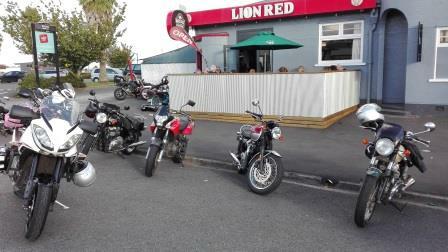 From Hamilton was Ray & Maxine, Trev, Kerry and Brenda (on a brand spanking T120), Allen plus Bryan & Sue. From Tauranga, Grant & Rose, Geoff plus Judi. From Rotorua was a sole representative Dazza and from Waihi was Pete & Sue and Steve (on a brand spanking new Commander). For a short time we were joined by Raj and Helen on a Rocket who were on a week’s Holiday cruising the NI coastline. Meeting place was at Paeroa at 10:00am or was that 10:30am? (nobody seemed to know or care). 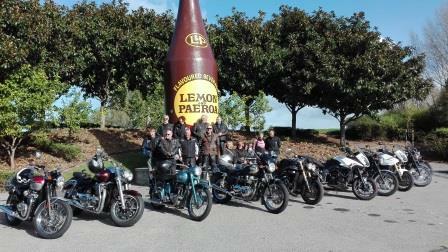 Once the group photographic evidence was obtained in front of the giant L&P bottle in Paeroa Pete being the only person on a Meriden took the lead. Pearoa to Thames and up the coast was the first leg to Coromandel Township with a stop on top of the hills to admire the view. 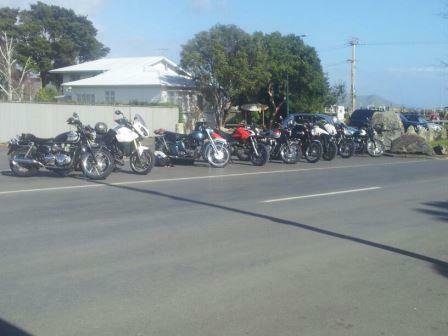 There were heaps of bikes on the road as it was a great day blue sky’s with no wind a great day to be a motorcyclist. It is always a great ride up this coast when the Firth of Thames is flat calm. 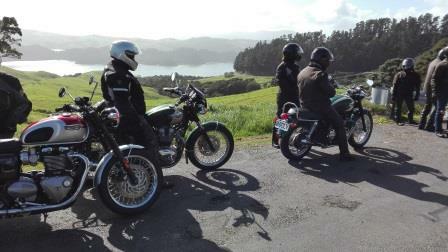 After the Coromandel lunch stop it was up over the hills down past Matarangi and through Whitianga to Tairua for gas. After Tairau we headed down through Whangamata and out to Waihi where we stopped to de-brief and strategize on our various journeys home at a local watering hole. Those who have ridden the Coromandel loop before will know the twisty nature of the coast line it is certainly an enjoyable ride and one of the better rides in our great country. 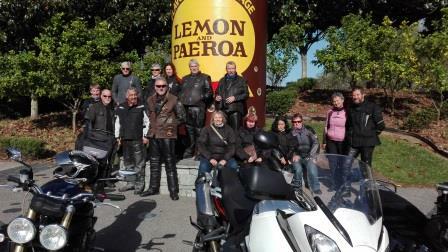 Most departed from Waihi just after 4:00pm so they were home before dark head back to Papamoa, Rotorua and Hamilton. We got home just on 6:00pm doing 430kms in total. Thanks to the organisers and those who attended for making it a great incident free day out. More photos on Face Book.